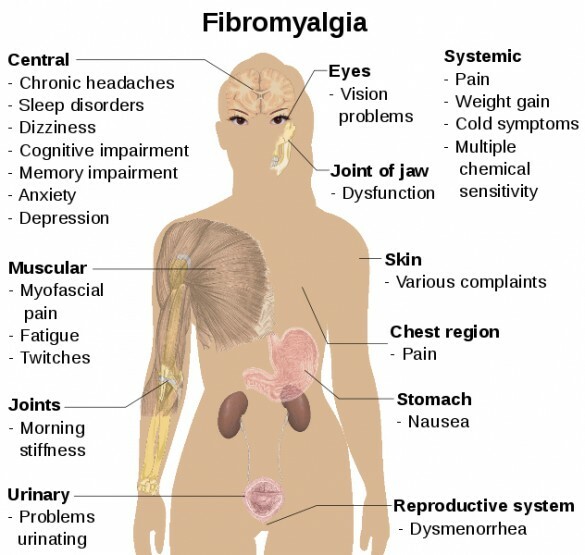 Fibromyalgia Syndrome (FMS) is a chronic debilitating state of widespread musculoskeletal pain, stiffness, and fatigue. Unlike arthritis, the term “myalgia” refers to muscular pain not joint pain, primarily felt in fibrous tissues, muscles, tendons, ligaments and other “white” connective tissues. Both fibrositis and fibromyalgia are used interchangeably, but the latter term more accurately describes the condition. In order to clarify the condition the American College of Rheumatology developed criteria for diagnosis in 1990. Generally, there must be a history of widespread pain throughout the body, including pain in 11 of 18 tender point sites with a finger pressure of around 4kg. Sites include the suboccipital muscle insertions at the occiput, the lower cervical paraspinals, the trapezius at midpoint of the upper border, the supraspinatus at its origin above medial scapular spine, the 2nd costochondral junction, 2 cm distal to the lateral epicondyle in the forearm, upper outer quadrant of buttock, greater trochanter, and at the knee just proximal to the medial joint line (Wolfe et al 1990). Although medical practitioners commonly refer FMS patients to a psychiatrist, research suggests that FMS may be an autoimmune condition. A great deal of evidence suggests that FMS is the result of immune dysfunction. For example, antibodies to cardiolipin , which is often a feature of autoimmune disorders, have been found in FMS patients presenting with neuropathic symptoms (Romano and Homburger 1991). In another study, researchers reported that an influenza virus infection may be a possible contributory factor to FMS. All patients in this study reported a history of chronic upper respiratory infection, along with associated neurological symptoms prior to the onset of FMS (Tyler and Allen 1997). Abnormal immunity in FMS victims is also evidenced by studies in which biopsies of muscles found edema, elevated numbers of mast cells, and increased fluid content, suggestive of allergy. FMS is seen more often in patients suffering from immune-related disorders such as Sjogren’s syndrome, rheumatoid arthritis, Raynaud’s phenomenon, and autoimmune thyroiditis (leading to hypothyroidism). In one study, researchers studied 60 patients with systemic lupus erythematosus, 10 of which were classified as positive for fibomylagia, suggesting that patients with SLE are at risk of developing secondary fibromyalgia (Grafe et al 1999). Sleep deprivation has been found to reproduce the immune system dysfunction seen in FMS. It appears that FMS may be due to non-restorative deep sleep, an alpha EEG sleep anomaly in non-REM sleep, that initiates a series of immune system abnormalities (Moldofsky 1975; Moldofsky 1993; Moldofsky 1995). This type of abnormal sleep causes elevations in certain cytokines such as interleukin-2, found to be elevated in FMS patients (Wallace 1990). The medical treatment of fibromyalgia relies for the most part upon the oral administration of NSAIDs and corticosteroids, as well as the local administration of anesthetics such as lidocaine. Most often some kind of antidepressant is administered, such as a tricylic (e.g.amitryptyline), an SSRI (e.g. fluoxetine, paroxetine), or SNRI (e.g.milnacipran). Other medications include few anti-seizure drugs (e.g. gabapentin) and muscle relaxants (e.g. cyclobenzaprine). Unfortunately, such drugs often interfere with the REM sleep so badly needed by FMS patients. A newer therapy that is gaining some acceptance among physicians is prolotherapy, which involves the injection of an irritant solution into weak or damaged ligaments. The resulting localized inflammatory response is thought to enhance fibroblast activity, which can end up making the ligament about 30-40% stronger. Patients undergoing prolotherapy, however, are typically directed to refrain from using both NSAIDs and corticosteroids as they will interfere with the effectiveness of the treatment by inhibiting the inflammatory/immune response. As an autoimmune disease (AI), fibromyalgia displays the same etiological as other AI diseases such as rheumatoid arthritis, including intestinal permeability – called amavata in Ayurveda. The type of general diet and lifestyle changes outlined under these conditions are employed in fibromyalgia over a period of several months, but improvement is often noted within a 4-6 week period. Nutmeg (Myristica fragrans) is useful herb to help with the pain of fibromyalgia at night. It has an antispasmodic and sedative activity with a four to six hour onset. Ideally the patient should grind enough of the whole fruit in a coffee grinder to last for about a week: if left too long the medicinal volatile oils will degrade, and thus, commercial nutmeg powder is to be avoided. The only other way to preserve its medicinal properties is to make a tincture of the crushed fruit, as a percolation or maceration, with at least 50% ethyl alcohol. The typical starting dose for Nutmeg is between 1/2 to 1 tsp of the freshly powdered dried fruit, or up to 3-5 mL of the tincture, before bed. Other useful nervine, antispasmodic, and sedative herbs include Reishi mushroom (Ganoderma spp. ), Brahmi (Bacopa monnieri), St John’s Wort (Hypericum perforatum), Skullcap (Scutellaria lateriflora), Lobelia (Lobelia inflata), Ashwagandha (Withania somnifera), Myrrh (Commiphora myrrha), Yan Hu Suo (Corydalis yanhusuo), Jamaican Dogwood (Piscidia erythrina), Himalayan Blue Poppy (Meconopsis grandis), and Marijuana (Cannabis sativa). Other potentially helpful agents include magnesium (e.g. magnesium bisglycinate), malic acid, and 5-HTP (5-hydroxytryptophan). Massage therapy is an important aspect to treatment of fibromyalgia, with particular attention being paid not just to the trigger points, but to other regions of the body that may be compensating for the pain and weakness. Useful medicated oils include Balm of Gilead oil (Populus trichocarpa bud), Mahanarayana taila and Kottamchhukadi taila. Diluted essential oils can also be used, such as Lavender, Ginger, Rosemary, Black Pepper, Eucalyptus, Camphor, Juniper and Chamomile. The massage therapy itself should be responsive to the needs of the patient, but may include specific treatments to sensitive trigger points, including oil-dripping treatments such as dhara or pizzichil with medicated oils such as Kshirabala taila. Heat is applied after oleation, used locally as a heated mat or bed, hot stone massage, heating pad, or hot water bottle; or applied more generally as a wet sauna or a magnesium sulfate/chloride). Kelp baths and wraps, available in some spas, or prepared at home, can also provide relief. In addition to massage, physical exercise is important to restore proper muscle tone and strength. As such, some kind of gentle physical exercise such as Tai Chi or Yoga is practiced everyday to stretch and challenge the muscles, gradually working up to a moderately vigorous exercise routine (e.g. 5BX for men, XBX for women), as well as regular walking (45-60 minutes daily).